The Bible affirms the existence of an inhabited supernatural realm. It uses the term angel in reference to certain beings that inhabit that realm. The word angel comes from the Greek word angelos, which means messenger. The name is appropriate since angels often function in the role of messengers sent from God: "1 John, am the one who heard and saw these things. And when I had heard and seen them, I fell down to worship at the feet of the angel who had been showing them to me. But he said to me, 'Do not do it ... Worship God!'" (Revelation 22:8-9). A second function of angels is to carry out God's decrees. "He called out in a loud voice to the four angels who had been given power to harm the land and the sea: 'Do not harm the land or the sea or the trees until we put a seal on the foreheads of the servants of our God'" (Revelation 7:2-3). 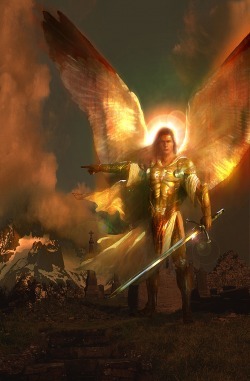 In the Bible, angels are generally referred to in the masculine. They are created beings, and they have free will. The majority of angels love, worship, and serve God, but a lesser number have chosen to reject God and to follow Satan. Those who have rejected God are often referred to as demons, evil spirits, or fallen angels. Lucifer is a fallen angel. Angels have a genuine interest in humanity, and the vast majority desire to see human beings restored to fellowship with God: "In the same way, I tell you, there is rejoicing in the presence of the angels of God over one sinner who repents" (Luke 15:10). The term angel can also be used in reference to a human, again, in the context of a messenger. The majority opinion is that the angels of the seven churches mentioned in Revelation chapters two and three refer to the human leaders of these churches. Christians are instructed to test the messenger by testing the message. The message must be totally in accord with Scripture -- there will never be a "new revelation" that will contradict what God has already revealed: "Evidently some people are throwing you into confusion and are trying to pervert the gospel of Christ. But even if we or an angel from heaven should preach a gospel other than the one we preached to you, let him be eternally condemned" (Galatians 1:7-8). This instruction is written to Christians -- it is a warning that both human and angelic messengers will attempt to lead Christians astray. Many, if not all, cults are founded upon the teachings of messengers who are in reality teaching doctrines of demons. The Christian must test every messenger and message by the word of God.